Buy Clearspring Organic Apple & Apricot Fruit Puree - 2 x 100g in the UK from our online shop or directly from our independent Scottish store. The exceptional flavour of theses fruit purees comes from using specially selected ripe organic fruit and prepared with the minimum of heating so the fruit retains all of its natural goodness. No added sugar, just fruit! All of the organic fruit purees are made without added concentrates, sweeteners, sugar, preservatives, or artificial colourings or flavourings. As official Clearspring stockist, we sell genuine Fruit Purees directly from our shop in Scotland and online throughout the UK. Where can you buy real Apple & Apricot Puree safely online? 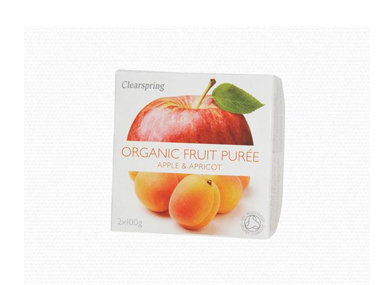 If you are wondering where you can buy Clearspring Organic Apple & Apricot Fruit Puree - 2 x 100g safely online in the UK, then shop with us. We are an actual health foods shop; with real people selling real foods and products. Our award-winning independent shop is located in Stirling, Scotland since 1976. You can buy our Organic food and other genuine Fruit Purees in store or safely place an order with us online or over the phone. Apple & Apricot Puree - Clearspring Organic Apple & Apricot Fruit Puree - 2 x 100g in Fruit Purees and Miscelanious Ingredients.